This piece was written by Sanaa Ali-Virani ’15, Christopher Chalaka ’15, Bryan Chen ’15, Matthew Chen ’17, Natalia Choi ’15, Amie Chou ’15, Damella Dotan ’15, Ben Goloff ’15, Pati Gutiérrez-Fregoso ’15, Hazlett Henderson ’17, Lillian Jamison-Cash ’15, Lekey Leidecker ’16, Daniel Orr ’16, Laura Rigell ’16, Kat Galvis Rodriguez ’17, Peera Songkünnatham ’15, Mayra Tenorio ’15, and Emily Zhang ’15. The authors of this piece recognize the complexities of representation. This document is an attempt to combat the overpowering white voices that are so prevalent in many spaces, but especially in environmental movements. In the process of writing this document, we reached out on the basis of preexisting relationships to people who may share these same frustrations. We recognize that the listed authors are not representative of all students who would have wanted to contribute, and we feel as though it is important to explicitly state that this document was not spearheaded by white people. What this document tries to do is to create a pro-environmental justice space that is critical of MJ and white environmentalism in a polarized campus context where one must either be pro-environment and pro-MJ OR anti-environment and anti-MJ. There has been a harmful dynamic on this campus where students, especially people of color (POC), are essentially forced to choose between environmental justice and racial justice, and those of us who identify as POC and refuse to choose are often made to feel as though we have to apologize. One of our hopes for this op-ed is that it helps launch a culture in which it is ok to be pro-environment and stand up for racial justice at the same time. We recognize that this is not the end of the conversation; in fact, we hope that this can catalyze more dialogue. In this article, we will use the terms Climate Justice and frontline community in our critique of Mountain Justice as it currently operates. As part of the larger Environmental Justice (EJ) framework, Climate Justice (CJ) recognizes that those least responsible for climate change bear the brunt of its negative impacts, and that addressing climate change requires shifting these burdens to create a more equitable world. Climate Justice demands centering and respecting the voices of frontline communities, those directly impacted by fossil fuel extraction and combustion. We believe that Swarthmore College must divest from fossil fuels. We support Swarthmore Mountain Justice’s (MJ) campaign, and we support the sit-in that is happening now on Parrish 2nd. We respect the time and energy that the MJ organizers have put into the divestment campaign. We believe that divestment is a necessary step toward building the political power to undermine the fossil fuel industry and create a sustainable future. Since its beginning, we have seen two narratives over the course of MJ’s campaign: one that centers frontline communities’ activism and one that centers leaders of the group with a tokenizing mention of the frontlines. We have also seen a shift in the structure of the group, from inclusivity and consensus to a hierarchy that does not make space for critique. The authors of this article come from differing relationships with MJ and environmental action. As a group, we maintain that MJ has an invaluable opportunity to re-evaluate its internal structure and cultivate authentic relationships with other activists on and off campus. Furthermore, MJ needs to commit to action in line with a fully intersectional, Climate Justice analysis that comprises other pressing issues such as racial injustice and economic inequality. This is not an attack on MJ as people or organizers, but rather a reminder that, historically, mainstream environmental movements have tended to exclude those who are most marginalized. This tendency is a larger structural problem, not just a fault of an individual campaign, though we challenge MJ to resist that trend. We understand that it is hard to balance the practical implications of fast action with intentional community-building, but we think this is an opportune moment to make a push to focus on the latter. Two-and-a-half weeks into the sit-in and as the May Board meeting nears, MJ could be approaching a turning point. And so, at this moment, we would like to offer suggestions to MJ to highlight both the oppression faced by and the resistance of those who are suffering the most at the hands of the fossil fuel industry. MJ’s direct action comes in the wake of the Black Liberation 1969 project, which re-examines the events surrounding the 1969 sit-in, as well as the student-led revisiting of the protests and demands of the Spring of 2013. Unfortunately, MJ has bypassed opportunities to lift up these two histories of resistance. MJ’s Parrish sit-in is certainly not the first. Though it may be the largest, it is important to recognize how it differs from actions of the past. Their action recalls the 1969 sit-in led by the Swarthmore Afro-American Student Society (SASS) in the admissions office. Neglecting the different levels of risk due to race and political climate ignores the differences between the two sit-ins. The Black students demanding increased Black enrollment, faculty, and administration, as well as Black Studies coursework and a bridge program, faced threats against their safety: alumni wrote suggesting that the students be expelled, Swarthmore police offered to remove the students, and the FBI recruited Swarthmore staff as informants. This harsh reaction demonstrated their racism and fear of mobilized POC; they focused on dispersing the organizers rather than addressing their concerns. Fortunately, today there is less threat of physical danger to members of the sit-in. MJ must ask itself why it has received so little pushback from those in positions of power at this institution and for what reasons students can participate in large numbers and not have to fear for their safety. Echoing that, this sit-in could be a powerful way to remember resistances in Swarthmore’s history. It is disappointing that MJ is lauding the size of the sit-in while failing to explicitly acknowledge this tactic’s history on this campus. In Spring of 2013, students were again met with a dismissive administration in response to a set of demands. After the series of urinations on the door of the Intercultural Center, students mobilized to resist the oppressive structures that continue to pervade administrative action and campus culture. MJ appropriately ceded its place in the spotlight that May, by taking the microphone from notoriously inaccessible Board members at an open debate with the Board and handing it to a coalition of students who had been leading the resistance since the fifth urination, as well as leaders of other campaigns for social justice. In the debrief after the Board meeting action, members of the IC expressed their appreciation for MJ’s decision to de-center divestment in that moment. They encouraged MJ to continue to work in coalition with other campaigns for social justice on campus. Since the Spring of 2013, however, MJ has done little to work in coalition with EJ/CJ or other social justice groups on campus. Rather, it seems that MJ has misremembered the collaboration of May 2013, describing the “Board takeover” as a 200-person action for divestment. In short, MJ has failed to stand in solidarity with other on-campus activist groups, erasing the work of previous struggles on campus and neglecting an opportunity to retell and emphasize the history of their resistances. Bill McKibben was recently invited by MJ to lead a rally in support of the sit-in and the Swarthmore divestment movement. At the center of Swarthmore’s and the media’s attention, he delivered a rousing pep-talk encouraging everyone to attend the sit-in on Parrish 2nd, which he called the “white, hot center” of the fight against climate change. McKibben’s talk needs to be put into the context of the mainstream environmentalist movement. Historically, environmentalism has centered the experiences and goals of higher-income, white men. The movement thus has a problematic legacy of benefiting white people and prioritizing false solutions to solve environmental problems at the expense of indigenous peoples and communities of color. In the name of “solving” environmental issues, people are removed from their land, toxic and nuclear waste is dumped in communities of color, and destructive extractivist industries are sited in poor communities. Because of this persistent neo-colonial oppression worldwide, many peoples’ traditional or indigenous knowledge and relationships with land have either been destroyed or denied. The California Wilderness Act, authored in the name of environmental interests, removed California Natives from their homelands. These systemic processes are perpetuated by lifting the voices of middle to upper-class white men and erasing the experiences of directly-impacted communities to find solutions to environmental problems. That is why the work of Environmental Justice and Climate Justice organizers requires that we center frontline activists and directly impacted communities. MJ’s decision last month to bring McKibben is a departure from their previous narrative, which highlighted people in directly-impacted communities. 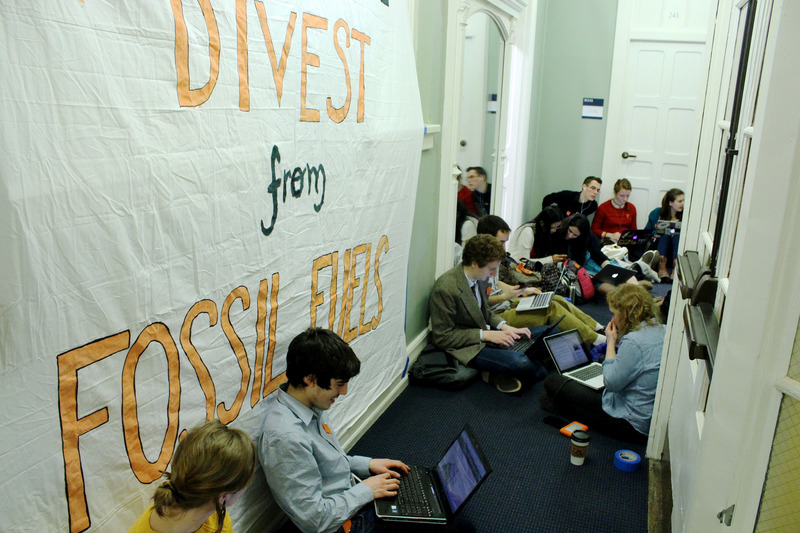 In 2013, MJ planned a divestment convergence to bring together fossil fuel divestment activists from around the country. The idea was to share information and strategies about the campaign and to lift up the voices of people from directly-impacted communities. For this reason, when the option to include Bill McKibben as a speaker arose, MJ turned it down, instead inviting frontline activists resisting tar sands in Alberta, fracking in Pennsylvania, mountain top removal coal mining in West Virginia, coal-fired power plants in Chicago, and a range of others whose voices are often overlooked in mainstream environmental movements. At this moment, MJ must not only center the voices of directly-impacted communities that exist off-campus and nearby in Chester, but also students here who identify as members of such. MJ should look at whether the communities it claims to be in solidarity with are leading the movement or included in the decision-making process in a genuine way. How movements acknowledge histories of exclusion and who is chosen to speak at rallies will impact whether or not certain students feel uncomfortable and excluded from these spaces. We encourage MJ to conscientiously reevaluate who is at the “white, hot” center of the movement. MJ must explicitly recognize how it has borrowed tactics from other movements, such as the 1969 Black students’ sit-in. Instead of disregarding that history, MJ can make space to talk about how the struggle for Black liberation is connected to EJ. Similarly, MJ can recognize the racism inherent in many environmentalist spaces. It should ensure that members are aware of this legacy and the tension that it invokes between environmental and other social justice movements. Forming deep and genuine relationships between movements and between individuals is a crucial component of the CJ movement. MJ must stand in solidarity with the IC/BCC and social justice groups on campus. Attending these groups’ events, as allies (not as representatives of MJ with the goal of talking about divestment), would be one demonstration of a commitment to solidarity. For example, joining the upcoming discussion, “Toward Future Coalition Building: Revisit Spring 2013 Student Demands,” (on April 13 at 4:30 p.m.) would show that MJ members are committed to retelling the history of the Spring of 2013 in a meaningful way. MJ must recenter frontline communities by returning to the idea of divestment as for communities directly impacted by extreme fossil fuel extraction. MJ must not only stand in solidarity with but take leadership from the frontlines. To start, we invite you to join us in learning directly from the words written by POC, indigenous people, and people from the Global South. The sit-in is an excellent opportunity to center this kind of programming. Take advantage of the sit-in space by hosting discussions about the links between EJ and allyship, with reference to the Allyship and Anti-Oppression Resource Guide; screening films about frontline resistance work; providing opportunities to discuss readings by marginalized CJ activists; and inviting students involved in the 1969 class to share their research. We offer these suggestions recognizing that there is not one definitive set of actions that will constitute the process of Climate Justice. We all must work to establish authentic relationships with each other and people at the frontlines – not in order to “get” anything from them or “give” anything to them, but rather, for its own sake. Divestment movements across the country look up to MJ for both strategy and direction; and so, it is crucial that MJ set a precedent for how a divestment campaign can enact Climate Justice. All that being said, let’s divest. We would like to especially thank the contributors to the Black Liberation 1969 database. Without their attention to keeping alive institutional memory, we would not have been able to make the connections in this piece. William Reid, “[Letter from William Reid ’51 to Alumni Annual Giving Fund, 01/17/1969],” Black Liberation 1969 Archive, accessed April 6, 2015, http://blacklib1969.swarthmore.edu/items/show/965. Pusey Bancroft Heald, “[Letter from Pusey Bancroft Heald ’18 to Joseph Shane, 01/20/1969],” Black Liberation 1969 Archive, accessed April 6, 2015, http://blacklib1969.swarthmore.edu/items/show/964. David Ullman, “[Letter from David Ullman to Courtney Smith, 01/14/1969],” Black Liberation 1969 Archive, accessed April 6, 2015, http://blacklib1969.swarthmore.edu/items/show/904. Rosalind Plummer, Maria Mejia, and Ali Roseberry-Polier, “Rosalind Plummer (Wood),” Black Liberation 1969 Archive, accessed April 6, 2015, http://blacklib1969.swarthmore.edu/items/show/1042. Swarthmore Police Department and William Weidner, “Initial Report Re: Student Protest at Swarthmore College,” Black Liberation 1969 Archive, accessed April 6, 2015, http://blacklib1969.swarthmore.edu/items/show/820. Michael Fields et al., “Men’s Group Interview,” Black Liberation 1969 Archive, accessed April 6, 2015, http://blacklib1969.swarthmore.edu/items/show/1147. ← NBC’s One Big Happy: A Lesbian Sitcom? As an MJ member and someone who has been at the sit-in since it’s inception, this article is fantastic. I for one will start working personally to help bring about the changes suggested. In short, I believe every person who worked on that letter was acting some personal issue out that has nothing to do with MJ, the sit in, environmentalism or any of the issues they raise about POC in their letter. movement that disproportionately attracts middle class white activists. The anti-war movement of the 1970’s was similarly accused. Criticizing the speaking invitation to Bill McKibben is unfounded. cause addressed by a world-renowned expert? Laura Rigell was one of the most senior members of MJ and among the first people in the organization but quit fairly recently due to the issues raised in this letter. By completely dismissing the concerns raised by the letter writers, you are pretty much assuring me that MJ will be as problematic as it has been. It takes a special type of ideologue to refuse any sort of criticism, especially when it’s about something that you claim to care about. I agree with the article above that the climate movement has to be extremely inclusive in order to represent those most affected by global warming. I know that Bill McKibben and 350.org are very aware of that fact and they continually reach out to communities all over the world. At the People’s Climate March, representatives from many of the most affected communities in the world were put at the head of the parade and it was very moving to see them there. I hope that every student on campus who feels underrepresented at the sit-in will walk over there, join in, and speak up if you want your views to be heard. By doing so, you will automatically make the sit-in more diverse! We need all of you to speak up because it is your future that is being threatened. One historical note: the students who sat in in 1969 were doing something very different from today’s students. They occupied the Admissions Office and would not let anyone else in. By risking their own safety, they showed their bravery and commitment. I believe that the current students would be presumptuous to make too great a parallel to that sit-in because of the inherent differences between the two sit-ins. It’s good to remember and honor the 1969 sit-in because it was pivotal, but it is not really equivalent to today’s sit-in and any reference to it should include those differences. Finally, just a quick point. I think maybe the phrase “white hot” was misunderstood or taken out of context. The phrase “white hot,” means “extremely hot,” not “white people are at the center of this movement and it is hot.” Bill could have just as easily said, “red hot.” I do not see anything significant in the term “white hot” and I am sure he did not use it in a way intended to exclude anyone. I am an old white male living 2000 miles and 50 years from Swarthmore College. My thanks go to the authors of this Opinion. I find it remarkable that you have the time and energy to so thoughtful and active–and still be Swarthmore students. I hope that you continue your activism! PS: with climate change, aren’t we all members of frontline communities? requiring people to agree with you on every issue to be with you on any issue is a good way to make sure no issue gets any traction. If you want the entire world (or a significant chunk) to agree with you on climate change, you can’t exclude people. Even if they are racist assholes. They’re both problems, yeah, and it’s dumb to disagree with either one. but don’t alienate people who want to follow you??? Sorry Mountain Justice, but we have conducted a thorough review of your demographic representation and found a representation of white people that is about consistent with what one would expect based on the racial breakdown of Swarthmore’s campus. Obviously, this is unacceptable. As a social justice movement, you guys cannot afford to have any white voices campaigning for issues. Nevermind the fact that environmentalism has nothing to do with racial injustice; the fact of the matter is that you guys are a social justice movement and therefore INTERSECTIONALITY is of the utmost importance. Before you guys push for any more environmental issues, we would like a signed statement from each white student in MJ apologizing for the sins of their ancestors, as well as a video submission from each white person that shows them whipping themselves to atone for their privilege. Thanks, and have a nice day! environmentalism has everything to do with racial injustice. The issue is that this article is asking for extremely high standards from MJ for other social justice groups here to support them. By withholding support to MJ on the basis that they haven’t repented for the mistakes in the environmental movement is a distraction from the movement as a whole. ” Historically, environmentalism has centered the experiences and goals of higher-income, white men. The movement thus has a problematic legacy of benefiting white people and prioritizing false solutions to solve environmental problems at the expense of indigenous peoples and communities of color.” Maybe the historic movement has the legacy of benefiting a few people in the expense of others, but if MJ’s goals themselves do not contribute to this legacy, then MJ shouldn’t be held responsible for what previous environmental movements have done before. MJ shouldn’t need to apologize for every single misstep that other environmental movements have done before. no one is asking MJ to apologize, and the article literally began by expressing the authors’ support for divestment and the on-going sit-in… if they mentioned the problematic legacy of the environmental movement it’s because there is concern that MJ is starting to reflect that history in its organizing tactics. they aren’t being asked to apologize for the flaws of other organizers, they’re being asked to do better, because they totally can (they have in the past) and they should. Except that no one is asking MJ to apologize and the article literally began by expressing the authors’ support of divestment and the sit-in… and they mentioned the legacy of the environmental movement to express concern that some of MJs organizing tactics do in fact reflect that legacy. It really just sounds like they want MJ to do better because they totauthor’s and should. This article offers nothing but constructive criticism. The second point of Part II (that there are fundamental “differences between the two sit-ins”) completely explains the first point of Part II (that MJ has not pointed out the parallels between its sit-in and the 1969 sit-in). The article is attacking MJ both for not saying they’re similar to SASS, while preemptively showing how problematic it would have been for MJ to make such a comparison. There are a lot of good arguments against divestment. But does it really matter that MJ is somehow not as morally ‘pure’ an organization as possible? The main reason why people aren’t so supportive of MJ is the possible effects of on the endowment and subsequently on financial aid. Whether MJ gives explicit recognition of the 1969 sit-ins is irrelevant. Did the Black Liberation 1969 sit-ins recognize the non-violent experiences of Gandhi in India as inspiration? Also, if the Black Liberation 1969 sit-ins did not occur, does that mean MJ would not have used the sit-in tactic? Hardly. Sit-ins are such a common part of civil disobedience that MJ would have chosen this tactic whether or not the history of 1969 occurred. The insistence on perfect moral purity by other social justice groups is harming, not helping, the environmental movement. Climate change affects everyone, and impacts the marginalized the most. At least those ‘white middle class’ people recognize that they have to stand up and fight against climate change. If you oppose MJ simply because they haven’t done their historical citations properly, or don’t have a perfect demographic representation within its ranks, then how much do you really care about the environment? You’re putting intersectional ideology ahead of the real, practical effects of climate change. To me this article doesn’t come off of critical of MJ so much as providing constructive criticism as to how to more effectively collaborate between environmentalist and race and class oriented struggles, which at heart are intrinsically connected, for as you mentioned yourself environmental issues most heavily impact marginalized groups. There’s nothing wrong with trying to create dialogue between MJ and other groups, as the authors here are doing. Years from now, you’ll wonder why you didn’t join them. It’s disappointing, this “laziness” that some Swarthmore students have bought into. When you graduate and go into the “real world”, you’ll see how ugly the world (and people) really are. And that’s all the reason you need to stand up against the status quo. Dare to change.